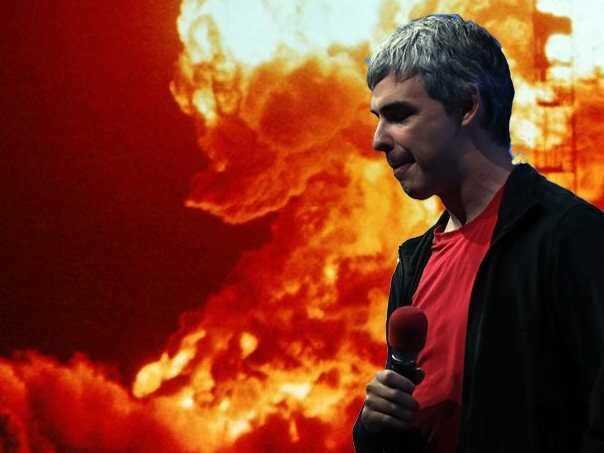 Getty Images/Justin SullivanGoogle founder Larry Page. If Google gets broken up because it’s a monopoly, it will be mostly Google’s fault. Today, the European Union took the first step in that extraordinary process: EU parliament members voted in favour of breaking up Google in order to end its monopoly in search. 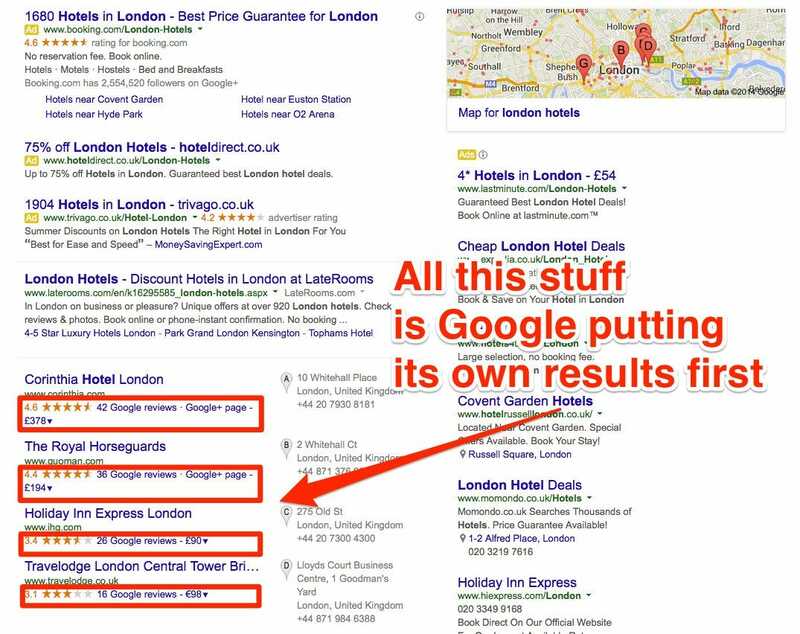 In Europe, 90% of search results come from Google. To be clear: We are a long, long way from actually seeing any part of Google hived off into a competing entity. It probably won’t happen. But the fact that regulatory bodies here are even considering it tells you just how many enemies Google has made over the years, and how obvious its monopoly is. Google is more dominant in Europe than in the US, even though it is an American company with a towering stateside presence. Everyone admits that Google is a de facto monopoly. Peter Thiel, the libertarian tech investor, has said so. Former Microsoft CEO Steve Ballmer thinks Google is a monopoly. Yelp has lobbied the EU, arguing the same. The US FTC has investigated Google for monopoly practices, although it has concluded no significant antitrust action needs be taken. Even Google chairman Eric Schmidt has admitted “we’re in that area.” Schmidt and Page once declined to testify to Congress on the topic of their monopoly status. The fact that it monopolises search is not in itself a bad thing. Merely being a monopoly is not a transgression, even in Europe. (It’s often a sign of natural success.) Rather, EU antitrust law applies when companies abuse their monopoly to manipulate markets around them unfairly. 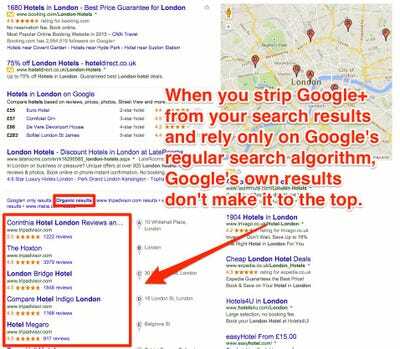 The best evidence for that came from Yelp and a coalition of companies it has formed who believe they are being screwed out of their natural, “organic” ranking in search results because Google simply dumps its own — often unhelpful — content on top of the “real” search ranking of which sites are best. Yelp’s evidence was elegant and simple: It used Google’s own search API to create a browser extension that displayed Google search results without results that include promo boxes generated from Google+, the unpopular identity/social network product that Google launched to counter Facebook. The extension shows you the “real” result generated by Google’s algorithm, without the self-promotional fluff that Google layers on top of it. The difference is alarming. 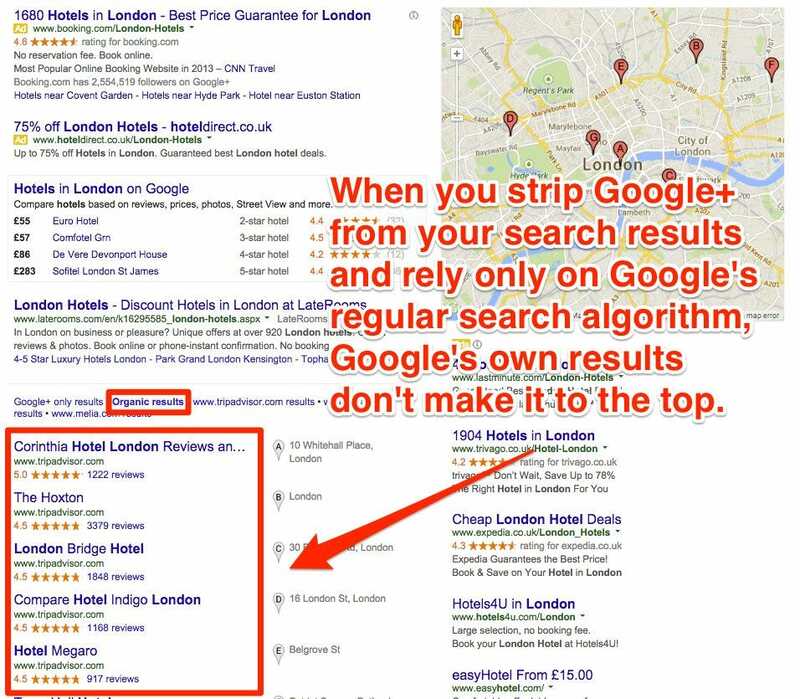 Hotel review sites like Tripadvisor — which have hundreds of reader reviews per hotel, and are thus good quality search results if you’re looking for hotels — get buried under Google’s own Google+ review boxes, in which only a handful of people have written reviews. 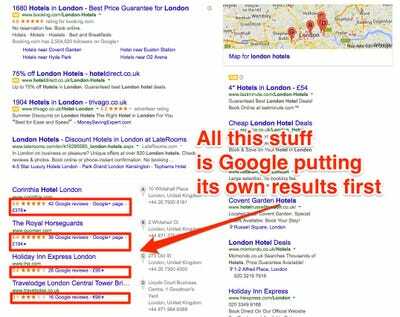 It’s difficult to argue that Google is serving the “best” hotel results if its own algorithm is being crammed down under auto-generated promo boxes for Google’s own properties. You should take this argument with a punch of salt: Yelp is an avowed enemy of Google. Yet … it’s compelling. Yelp is not alone. Dozens of companies believe Google uses its search might to dictate terms in industries that Google itself does not compete in. Expedia, TripAdvisor, Microsoft and a bunch of smaller companies have complained that Google sets competition rules within their industries. Even adultery website AshleyMadison has a case: It cannot advertise on certain Google properties, but Match.com can. Google doesn’t run dating sites, but it sets the rules through which they can advertise against each other. In Europe, they’re making progress.